Keep the dog close by. Then you can just slip the dog half of your stack as you go and you'll be left with a much more manageable number of hot dogs, like 40. Remember to swallow. 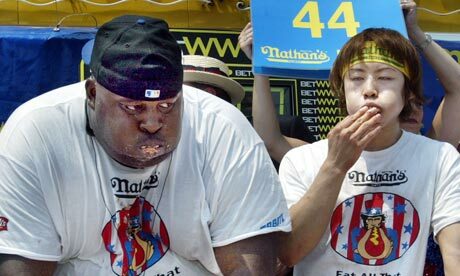 Like all sports, competitive eating is all about fundamentals, and this one is key. Unless you're able to secure a large amount of napkins before the competition. Just explain that you're a real neat freak and want to keep yourself in order. Then, as the competition gets under way, you can just continue to fill your mouth with hot dogs, only to turn slightly each time, spit them into a napkin, and then ball the napkin up and throw it under the table. I used to do this with chicken all the time when I was a kid. Believe me, it works. It will look like you finished all of your hot dogs and you'll be applauded for being such a good eater. Then you get ice cream! Don't compete against dogs. I've heard they can eat, like, 40 hot dogs in one sitting if given the chance. Also, avoid bears. Keep a positive attitude. It's amazing how much cased meat you can eat if you just believe that it's possible. Once you see how well the power of positive thinking works under these circumstances, the resulting colon cancer will be no biggie. Vomit on the other competitors' hot dogs. Oh sure, no one says anything to babies when they regurgitate in situations where it's personally advantageous, but yeah, I'm the disgusting one. In hot dog eating contests, as in business, sometimes the person most willing to purge on the table is the one that gets ahead. Trust me, I was a business major one semester in college. This strategy also allows you to then attack your hot dog stack at a more leisurely pace. Note: This tactic will not work if one or more of the other competitors are dogs or bears, in which case no amount of vomit is likely to deter them. Also, be aware that your barbecue seems to be taking place at a professional boxer's house or the Neverland Ranch. Like us on Facebook. Unless you put ketchup on your hot dog.